Brian Burke, president and general manager of the Toronto Maple Leafs, announced Monday that the hockey club has acquired from the Calgary Flames forward Wayne Primeau and Calgary’s second round draft pick in 2011 in exchange for defenceman Anton Stralman, forward Colin Stuart and Toronto’s seventh round draft pick in 2012. 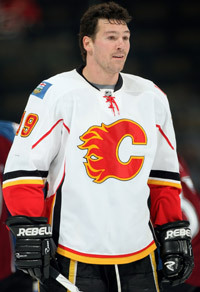 Primeau, a 33-year-old native of Scarborough, Ontario played in 24 games for Calgary in 2008-09 and registered four assists with 14 penalty minutes. The 6-4, 225-pound forward missed 58 regular season games and the playoffs this past season due to a foot injury. In 715 career NHL games with Calgary, Buffalo, Tampa Bay, Pittsburgh, San Jose and Boston, he has recorded 186 points on 66 goals and 120 assists with 754 minutes in penalties. Primeau was originally Buffalo’s first choice, selected 17th overall, in the 1994 Entry Draft. Stralman split the 2008-09 season between the Maple Leafs and the AHL’s Toronto Marlies. In 38 games for the Maple Leafs he collected one goal and 12 assists along with 20 penalty minutes. With the Marlies he earned seven goals and nine assists along with 24 minutes in penalties. Stralman was selected by the Leafs 216th overall in the 2005 Entry Draft. Stuart was originally acquired by the Leafs along with Garnet Exelby from the Atlanta Thrashers in exchange for Pavel Kubina and Tim Stapleton on July 1, 2009. Stuart played for both Atlanta and the AHL’s Chicago Wolves in 2008-09. In 33 games with the Thrashers he had five goals and three assists along with 18 penalty minutes.